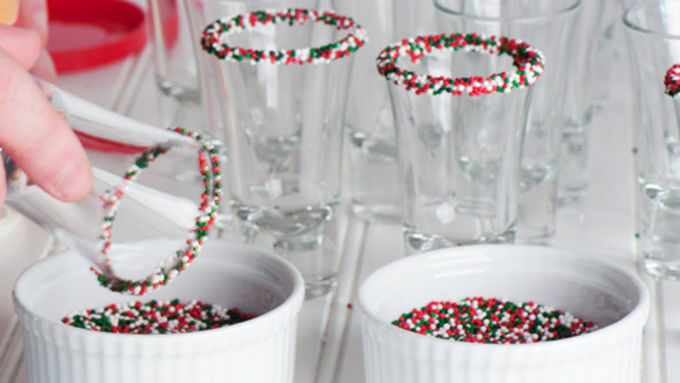 To decorate the rims of the glasses, dip edge into frosting, then into sprinkles. Combine ingredients in a pitcher, and taste for spiciness. Adjust by adding a little cinnamon schnapps or half and half, as needed. Refrigerate. 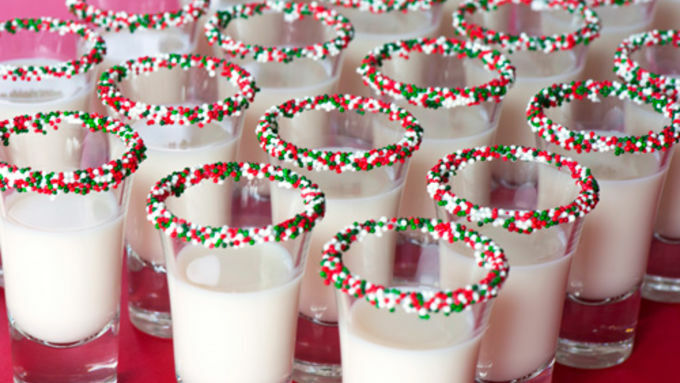 Note: If making in quantity for a party or event, these shots are best made ahead of time. Just combine ingredients in a pitcher, and refrigerate until ready to pour into individual shot glasses and serve. If making just 1 cocktail, stir ingredients in a mixing glass with ice, and strain into serving glass. It's striking that for a season as filled with festive cheer as December, most people's attempts at holiday cakes have, well, never been the best. Try as they might to find a fruitcake recipe that is light and airy, all too often the only thing any fruitcake is good for is propping open a door. Gingerbread houses are no better. Lacking an architectural degree, or a mason's sure sense, most of the gingerbread houses that I've seen would quickly be condemned as structurally unsound. The truth is that the cake batter is always the best part of any cake, fruit, holiday or otherwise. Lately there has been a lot of playful mixology surrounding cake flavored vodka and liqueurs, and “cake batter” martinis and shots. The juncture of this “cake batter” trend and cocktails is a little piece of heaven as far as I’m concerned. So, I give you the Spice Cake Batter Shot. Quick, easy, and believe me... a tray of these will disappear long before the fruitcake at your next holiday party! This cocktail hardly has a recipe because it's so simple. Simply combine ingredients, taste, and adjust. (If your Spiced Rum isn't quite spicy enough, a quick glug of cinnamon schnapps will help.) The sprinkled rim could not be easier, and this little visual touch is really what makes the shot "pop." Simply touch the tip of the the shot glass into the frosting. Note that you want a thin film of goodness to which your sprinkles will adhere, not a big gloppy rim. 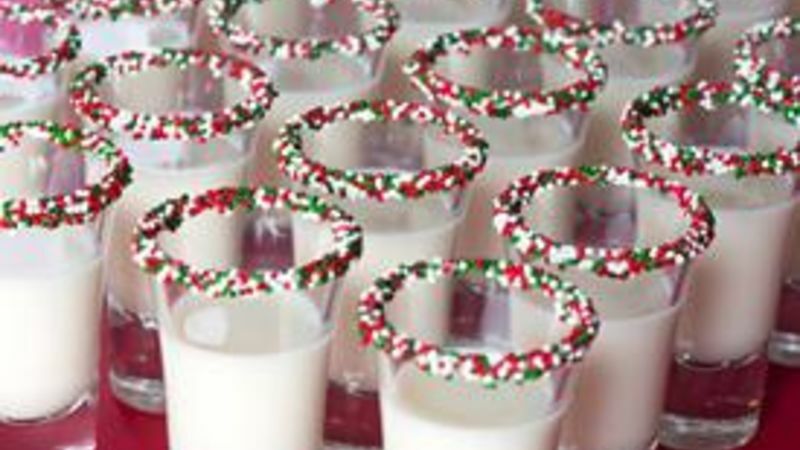 You will use hardly any frosting to rim even dozens of glasses (we barely scratched the surface of one container to rim 24 shot glasses!) ...so save the rest for baking another day! Let them eat cake...shots! These cake flavored shots are just what your party needs. Your guests will agree!